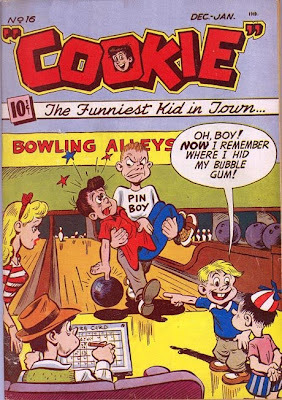 Original cover artist is unknown; American Comics Group 1948. Sam Henderson's website is here. I like how, in Henderson's version, it looks like the "pin boy" is carrying him off away from his family. The artist is probably Dan Gordon, who usually did this feature. He didn't sign it so there might be doubt. It looks exactly like Dan Gordon's beautiful cartooning. I bet it's him. This is one of my favorites on here. Don't really get the intent behind this one?